Birthdays haven’t been about candles, or even gifts, for a long time. They are more like markers for introspection. And this week, I celebrated my 61st birthday. I have written about leaning into aging – about finding the courage it takes to not focus on what hurts that didn’t used to, or to handle the subtle ways younger people may treat you differently. I am vastly aware of increased ambiguity as I age. It’s always been there. There just seems to be more of it. So I was excited when I got the opportunity to do something I had never done. I was asked to attend a therapeutic retreat for therapists, put on by a well-known psychiatric treatment center – a kind of emotional caregiving for caregivers. It would give me a chance to lean into that ambiguity. I was also nervous about going. I hadn’t been “in therapy” myself for a long time. I was much more accustomed to sitting on the other side of the Kleenex. I hemmed and hawed. I fussed around about scheduling and emailed questions about unknown details (that whole not in control thing…). The place was called The Ranch. Much of the public is stuck in the memory of “One Flew Over The Cuckoo’s Nest,” as far as psychiatric treatment is concerned, Nurse Ratchett and all. It’s nothing like that. This place is beautiful. Acres upon acres of a working ranch, cattle and all. It uses everything from experiential treatment, like equine therapy and zip-lines (“Things you do, you remember”) to group and individual therapy to help people heal. There were about two dozen of us – therapists from around the country. For two and a half days, they fed us, educated us about their program, and offered us the same therapeutic experiences they offer their patients. It was fascinating to work with the horses. I don’t know my way around horses and they have always frightened me just a little. So I was doing well to be calm. I watched others who actually rode cry unexpected tears as they hoisted themselves onto a very patient animal for the very first time. And then there was the sweat lodge. Steaming heat ran up to 130 degrees, as we sat cross-legged, packed into the small round dome covered in heavy blankets. Sweat, tears and whatever was coming from my nose poured out of me. For three hours, 20-odd of us prayed, sang, chanted, shared, laughed, thought, remembered, and let go. All in utter blackness, with only the light from glowing sacred rocks to illuminate and center us. I didn’t think my right knee was going to make it. But every time I tried to pull it into me for relief, it slipped out of my hands. It remains attached, but may never forgive me. The final day, we were led to a labyrinth. Perhaps some of you have walked a labyrinth, but I never had. In fact, I was fairly judgmental about them. What possible good could it do to follow a path with sharp turns that existed within a circle, until you reach the center, and then walk back out? I thought it was one of those New Age-y things, that went along with burning incense and wearing tie-dye. 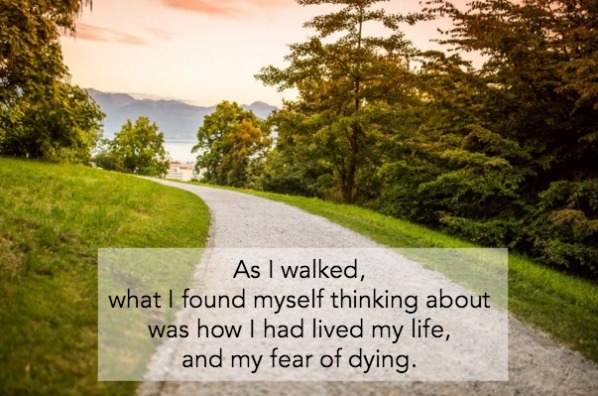 As I walked, what I found myself thinking about was how I had lived my life, and my fear of dying. As a turn approached, I realized I could not see the next section of the path – whether it was long or short, what direction it might take me. It hit me that this was like life. I had never known my path. I had never known if I turned, where that turn would lead me. I had never been able to predict when the turns might be. My only job was to continue walking. At that moment, I felt a deep inner peace and relief. Others had different experiences with the labyrinth. We all had the experience we needed to have. I am not sharing this to sell The Ranch or its treatment. I wasn’t paid to write it. I am sharing this because I too had anxiety about therapy. Was I willing to be the real me? Could I or would I talk about the things that were in my heart and mind? I did, and it was more than worth it. I am sharing this because I want to encourage you to look for these kinds of experiences. You will grow if you do, no matter what your age. I am sharing this because it’s hard for many of us to ask for help. I asked. And I received. Maybe you should consider it. It was a beautiful birthday gift. My gratitude belongs to all who gave it. Thank you for reading. Join the over 1000 subscribers and receive my posts in a weekly email – no other solicitations! Just put your email address in the gray box above! 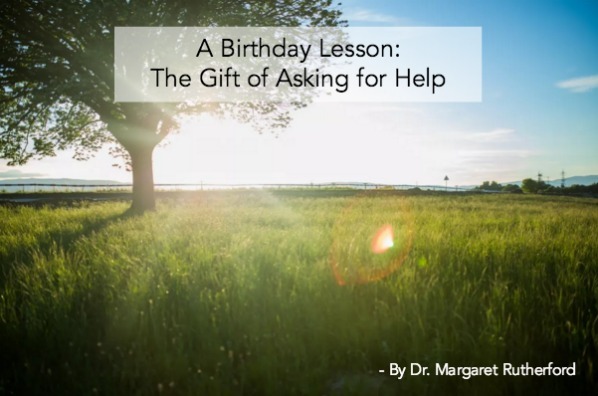 You can always contact me privately: askdrmargaret@146.66.99.73. Images courtesy of Negative Space.